Went to her new home on Saturday 18th December 2010.
following a short illness with bone cancer . 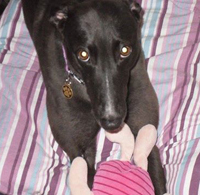 Poppy is a lovely small black ex-racing greyhound who has a lovely sweet nature. She is house trained, spayed, inoculated and microchipped. 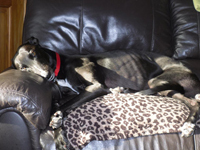 She walks nicely on the lead, travels well in the car and is alright with other breeds of dogs. Went to the South Lakes branch Christmas Fair today and Poppy met to her delight loads of people and other dogs. To say we'd only had her a short time and this was the first time she'd been to an event like this she did us proud. This morning we took Poppy for her cat test, which went well. This morning Poppy's new owners called to complete the adoption paperwork and take Poppy to her home with them. We hope she will have a long and happy life there living with Lizzy, Bruno the terrier and their two cats. Heard this afternoon from Poppy's new owner that Lzzy and Poppy were left on their own this afternoon and when they returned the corner on the indian wood table in the lounge had been chewed - the culprit was Poppy so the 'No chew' spray is going to be used to discourage her from doing it again. She did a similar thing to the corner of one of our tables when she first arrived, so it seems she is still a little uncertain of the big wide world, something that will get better in time as she feels more secure. suggested she see Ken Woodacre who does Osteopath and chiropractor type work with dogs and been involved with greyhounds for many, many years as he will be able to let them know what it is and more than likely correct it. Received an email today letting us know Poppy's new trick is to carry her feeding bowl to greet you at the door!!! Unfortunatley she picked up Bruno's ceramic bowl today which is quite heavy and greeted her ownere at the door at lunch time. It was really funny watching her trotting round with it until, whoops! and she dropped it on the ceramic kitchen floor, so its a new bowl for Bruno. Received an email this evening letting us know that Poppy saw Ken Woodacre this afernoon and it was her sciatic nerve. He found an old injury on her front right leg and he sorted the nerve on her right back leg. We received an email today letting us know that Poppy is beginning to come out of her shell and is now collecting anything and everything. She still wont sleep in her owner's bedroom, which she feels guilty as she wants her there and not leaving her in the lounge at night, however they leave the door open for her in case she wants to join them. Bruno wont leave Poppy alone and is always washing her at every opportunity! We received an email today from Poppy's new owner letting us know that they appreciate they have'nt had Poppy long but they could do with abit of help with her behaviour, When they go to work one of her owner's is last to leave about 9am - 9.30am and her other owner is back from work for about 12.30 lunch, in this short time Poppy has chewed cushions, tables and anything that has been left out by mistake. There is a large selection of soft toys and chewable toys for her to play with which are strewn all over the front room so plenty there to play with. She gets on well with Lizzy and Bruno and they play well together - a few questions were asked and some advise was given. We received an email today from Poppy's owners letting us know they are still having 'hiccups' with Poppy chewing. Besides the furniture, she has chewed the wii game console and started chewing the arm of the settee. They have been religiously been using' back soon' so today they bought a crate. They are going to put her bed and toys in and try and get her to use it when they are in. A few more questions were asked and some more advise was given including making a note of the times and what was going on prior to her chewing. I explained that no dog does anything without a reason, something is making her anxious and we just have to work out what it is, so by keeping a diary of events and times should show what is triggering her to behave the way she is doing. Later we received another email saying Poppy seems so content and happy when they are in the house she is no bother, she loves cuddles and gives kisses, plays with the toys, eats well and goes to the toliet well. Both owners are sticking to the suggestion that the first person home the 'rule' with the treat depends on what she has done, chewed or not chewed, and they will see how that goes. They have moved the table with the photo's on that she keeps chewing so the temptation isn't there. She only seems to chew in the morning after they leave for work if she is left in the afternoon she doesn't chew. Her owner tempted her in the crate tonight with treats and after she went in a couple of times she didn't push her anymore, a bed and toys are in there so they will coax her more over the next few days. They even suggested they might set a camera up as a last resort to see what happens in the mornings. Its the same routine every morning, One is up first and they are let out in the garden and then their breakfast, they then lounge whilst their other owners get ready, they both greet everyone with cuddles and kisses and off their owners go one at a time saying 'back soon' then they leave the radio on and they have all down stairs to themselves. They know it will take time and they are going to perservere with it as they have not had her long really, and are postive it will work out. Upon receiving this email I suggested that if they installed a camera to set it in motion before the first person got up and continue through the breakfast sequence and into the dogs being left on their own. Doing this would show if one of the family was not a 'morning person' and this was triggering it, or was something happening during the breakfast routine that started the anxiety, but no one notices it and by having the camera on when the dogs were on their own would show if she did it straight away or after a while, if one of the other dogs was doing something to trigger it or was something happening outside that was triggering it because it always happened in the morning, never in the afternoon. Another email arrived later saying they had put the crate in the lounge in the same place as her bed was and threw a rawhide chew in and hey presto she is laying in there now happily chewing away, so she seems happy enough to go in. We received an email today from Poppy's owner letting us know that when she went home today at lunch she tried something. She did what she usually does and said 'back soon' but in the hall way she slammed the front door and peeped through the glass panels in the door into the lounge. Poppy was still laying down and there were no signs of being worried that her owner had left. She then got up and wandered into the kitchen (probably to see if Bruno had left any dinner she could pinch) then came back through and laid down again whilst Bruno washed her. Poppy's owner opened the door and walked through as if she'd just returned and Poppy did'nt bat an eyelid. Again she walked out saying 'back soon', again opened the front door, shut it and spied through the panel again. Poppy just lay there showing no signs of being bothered, 5 minutes later and still nothing until Bruno suddenly flew up and jumps onto the back of the chair that stands in front of the window - someone had walked past on the other side of the road with a dog and Bruno always barks. Straight away Poppy was up trying to look out of the window and because there is a hedge at the front she couldn't see what he was barking at, then she started pacing up and down, becoming very anxious.That was when Poppy's owner suddenly had a thought - although Bruno isn't a barker he does when other dogs go past the house and was this what was setting Poppy off? As a result they are going to move the furniture around in the lounge so Bruno won't have a platform to the window and they are praying they will see a difference. Moving the furniture will be a big job as they have a 250 gallon fish tank to move!! We received an email from Poppy's owner letting us know they have moved the furniture around in the living room so Bruno can't have a perch and bark at people passing by, which is what seems to set Poppy off. They think because he has been barking and she can't see what he his barking at it makes her anxious. They are also putting some voiles up in the window to make sure he can't see out and hopefully it might have solved the need for Poppy to chew. One of Poppy's owners isn't at work at the moment so they will find out what happens when they leave the house empty. We heard today that Poppy is much better with all the alterations they've done in the living room. She only chews the odd item now instead of doing it constantly when they are out in the mornings, and those odd items they are going to work on. She is much better now that Bruno isn't able to see what is walking past the house. They are 70% there with Poppy and working with her to becoming fully relaxed with them, however one thing to consider is noise. Can Bruno hear what is walking past causing him to bark even though he can't see it and this is causing anxiety on the odd occasion for Poppy causing the issue not to be resolved completely. One way of tackling this is a radio - leave the radio on as this will help to mask the noises going on outside. We are so proud of Poppy's owners because Poppy caused quite a lot of damage, and many new owners would have just returned her. However, they stuck with her and with our guidance concentrated on when, what and why she was doing it. As I mentioned to them 'no dog does anything without a reason - it's just a case of you working out what it is, then you are half way to resolving it'. Spring is in the air and an email from Poppy's owner a few days ago was asking why Poppy, now she's found her confidence keeps barking at other dogs.They emailed tonight letting us know a friend who is a dog behavourist mentioned she is acting as a puppy would when meeting and seeing new dogs. There is no aggression so it's believed she is going through a second puppy hood. The behaviourist suggested Poppy's owner carried treats in her pocket and when a dog approaches to keep Poppy's attention with a trea. Trouble was when she tried it yesterday, she filled her pocket and went on a walk. When she went for a treat, none were there and her pocket was wet. Poppy's other owner then said ' oh i forgot, when you went for their leads Lizzy stuck her nose in your pocket and ate them'!!! Last Friday Poppy was having a good stretch and it sounded like a crack in her back leg, which she didn't bother about and there was no whimpering, but today on her walk she kept lagging behind and usually she is always first, so her owners are going to get to Ken Woodacre again when he is next in their area to have a look to see what may be wrong. Lizzy and Poppy came to visit today and had a great time running round the garden with the other greyhounds. Poppy's owner emailed today to let us know that Poppy's right eye keeps going a bit blood shot around the outside of the white, there is no weeping or discharge, and she's thinking of taking her to the vet, but someone said it could be with pulling on the lead which Poppy does quite badly at times if she isn't on her gentle leader. We received an email today from Poppy's owner saying they have got Poppy's pulling under control!! They tried the harness which was funny because she wasn't bothered about wearing it, but when they went out she would just stand there and not move!! One of her owners always takes the girls (Lizzy and Poppy) while her other owner always walks in front with Bruno. They tried one person walking Lizzy behind because she isn't bothered and the other walking in front with Poppy and Bruno at the side....Perfect, no pulling, all she wanted was to be in the lead. Poppy's owners are having one or two problems with her at the moment and she emailed to let us know they really want to get this barking and rearing at other dogs sorted because it's becomming an embarassment. However, they don't want to try and change so much too soon for her, but they have just bought her a padded harness to see if that will control her a bit better, and they will let us know how they get on. They are doing one thing at a time with her, first is feeding time with what I mentioned to them - pretending to eat her food, which is not good when its sardines, and that smell in your face!!! They haven't bumped into anybody yet on a walk through the fields so they haven't used the water spray as yet. They let Lizzy eat from Poppy's feeding bowl and since starting this Lizzy seems to be sticking up for herself with Poppy more lately. 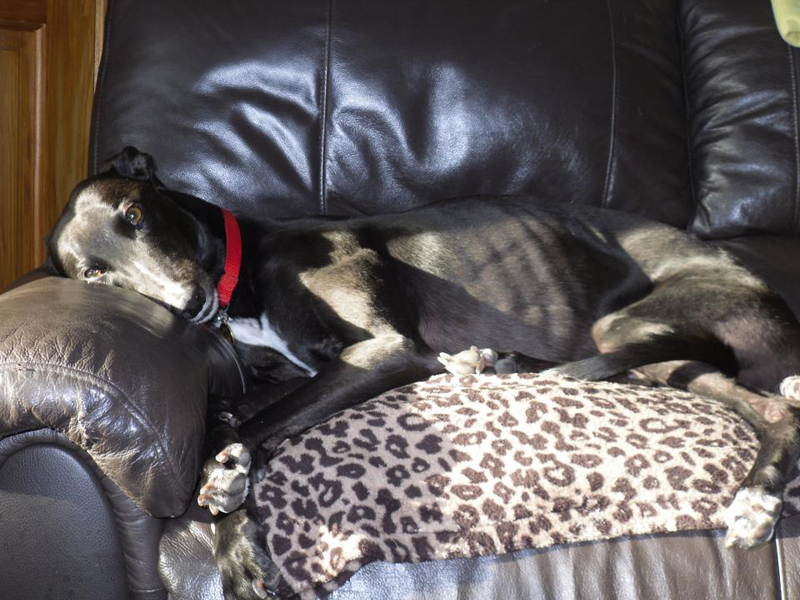 Today we received a lovely photograph of Poppy relaxing on the settee in the autumn sunshine. She looked a very happy girl! This morning we received a Christmas card sending us licks and kisses from Lizzy, Poppy and Bruno. We heard today that Poppy's owner is taking her to see Ken Woodacre (the Bone Man) next Tuesday. This will be the second time in six months. It looks as if this will be a on going visit every few months, it's her back right leg again. He always puts it right and you can see a difference with her afterwards for a while then it goes wrong again. They are going to ask him what he thinks could be causing it. Via Facebook we've just heard that Poppy went for her annual booster today and her owner asked the vet about booking her in for dental due to the condition of her back teeth, which is being done in about 2 weeks time. Her owner uses plaque off and brushes her teeth but they didn't seem to be getting rid of the tartar so it was thought best she have a dental to sort things out, and to make her feel better afterwards. We heard today that Poppy is due another visit to Ken Woodacre soon. She seems to have a recurring problem with her back that needs a visit to Ken almost every three months or so.It seems to be the same problem everytime. Via Facebook we heard that Poppy is visiting the vets today for a dental. We heard later the vet removed 18 teeth, so the heating was put on and a hot water bottle waiting on her bed for when she was coming home around 2.30pm. We heard today that Poppy went to see Ken Woodacre a couple of weeks ago for a check-up. He said all her back end was out again, so it looks like its going to be an on going thing that will need sorting every few months. We heard today via Facebook that Poppy has been having accidents in the front room without letting her owners know she wanted to go. 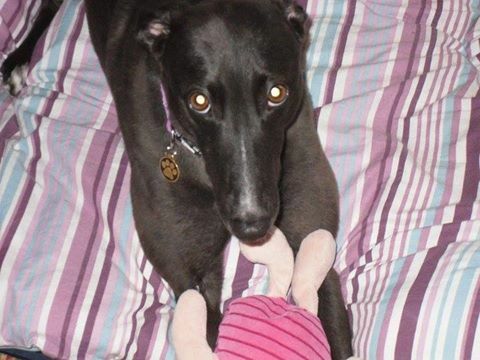 At first they thought it was behavioural problems when they took in a new greyhound called Cassie. In the end a water sample was taken to the vets who confirmed protein in her water and she was prescribed tablets to resolve the issue.
" Poppy's update: We dropped her off at vets this morning for xrays, just after 2pm today Chris our vet called with the news I have been dreading.... it is Osteosarcoma (bone cancer) in her shoulder blade,he showed us the xrays and it was so obvious a tumor and how much it had eaten the bone away. He gave us the option for her, one was euthanasia, but after I explained how comfortable she was at home, she goes out to toilet and gets up to eat he was happy to let her come home with steroids, we know its just a matter of weeks-months but as soon as she cant 'cope' anymore we will do the right thing, we dont want her to suffer. She is comfortable as I type just a bit groggy, she will be having her Christmas dinner and all the other goodies we shall shower her with, we have been truly lucky & blessed to have Pops 7 years and hopefully given her the love and affection all pups deserve, thanks Lynn x x "
Via Facebook we read tonight that sadly Poppy had passed away - here is the message her owner left.
" With a broken heart, we had to say goodbye to Poppy last night, it all happened so quickly from her being diagnosed Wednesday. Yesterday Morning her back legs went, and with her front leg she couldn't walk. We called the vets and he agreed it was the kindest thing to do, he suggested we went after the surgery closed for more privacy. We didnt want her in anymore pain. Good night my Poppylicous 💞09.06.2007 - 15.12.2017 "